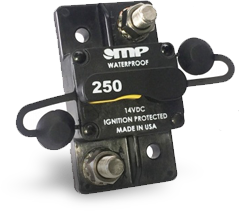 MP circuit breakers are typically tested to harsh Mil-Spec environmental standards such as shock, vibration, humidity and salt spray. 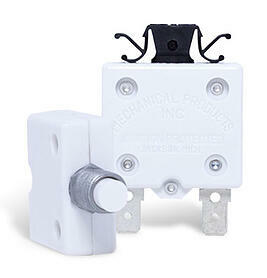 Weatherproof device or ingress protection levels of IP67 or the extremes of IP69K, MP has a circuit breaker to consider. 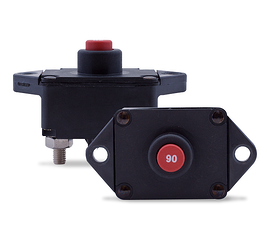 The Series 18 and 19 in 3 – 200A are protectors of choice for CON/AG Equipment. Their style/design are recognized by the industry as rugged/durable. Rugged protection is also offered in the Series 17 through 300A with many options. At 200 amps, what IP ratings does MP offer? The Ingress Protection rating for the Series 17 is IP67 for water immersion, while the Series 19 meets IP67 and IP69K for high pressure and high temperature spray down. What Hi-Amps trip types are available? The Series 17, 18 and 19 are available in Type 3 (push to reset) and Type-1 (auto-reset) styles, with the Series 17 also offered as a Type 3 (push to trip) circuit breaker. Does MP have Hi-Amp devices above 200 amps? 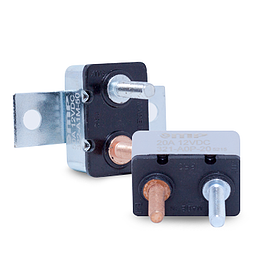 The Series 17 is offered in VDC ratings through 300 amps. Please see Series 17 data sheets for further details. What terminals are offered in the Series 18? Series 18 devices are available in #8-32 Screw Terminals (3-40A) and #10-32 Threaded Stud Terminals (12.5-60A). Do you have small Type 1-3 circuit breakers for Con/Ag Equipment? 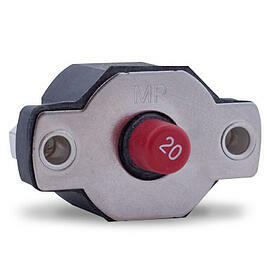 MP carries a comprehensive selection of “Short-Stops” in 3-50A ratings. Please see the Series 32 data sheet for further details. These devices have been color-coded for ease of ampere rating identification. What terminals are offered in surface mount Hi-Amp? To ease installation and save on wire length, the Series 17 surface mount is available through 300A in ¼” or 3/8” studs located in opposite corners of the device or in the (new) side-by-side configuration.